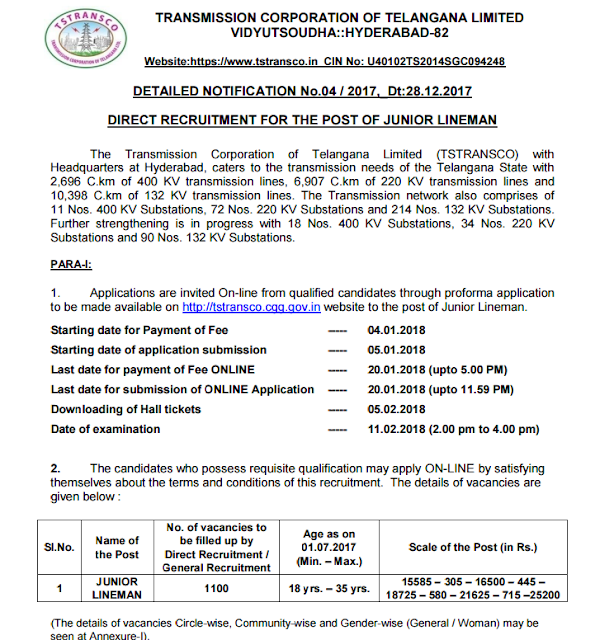 TSTRANSCO Junior Lineman Recruitment 2018 – Download Here Official PDF for Junior Lineman examination now. 11 Nos. 400 KV Substations, 72 Nos. 220 KV Substations and 214 Nos. 132 KV Substations. Substations and 90 Nos. 132 KV Substations. Age as on 01.07.2017 (Min. – Max. ): 18 yrs. – 35 yrs. to be made available on http://tstransco.cgg.gov.in website to the post of Junior Lineman.